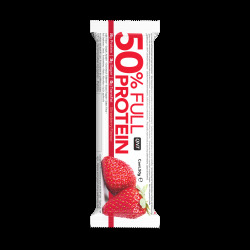 This highly nutritious snack, made with fruit and oats, is a very active concentrate, helping to release both a fast and sustained energy flow. Its unique taste and fruit combination (such as raisins and coconut) make it an ideal choice for all sportsmen and women who wish to maintain their performance throughout exercise. The right balance between proteins, carbohydrates and lipids, as well as its packaging (no chocolate coating melting in the heat!) makes this bar complimentary to any sport or activity. INGREDIENTS: oat flakes 32,5% (gluten), invert sugar syrup, banana flakes 10%, banana mash 10%, coconut flakes 9%, vegetable fat (palm oil), raisins 6,5%, humectant: glycerine, raw cane sugar, flavour, preservative: E202. ALLERGEN INFORMATION : Contains gluten. May contain traces of hen’s egg protein, milk (including lactose), soy and nuts.